To educate and encourage specially abled people to take active participation in the forthcoming Lok Sabha election, SVEEP team conducted an awareness camp on April 10 at PAGIR. 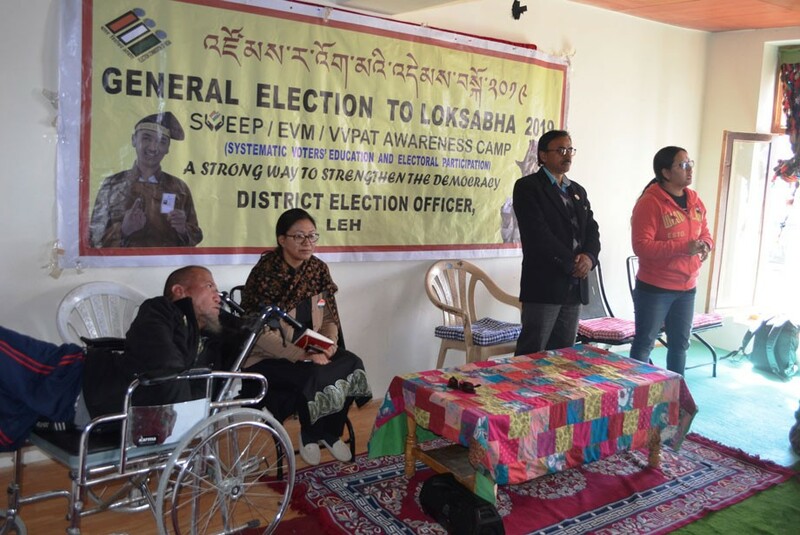 Tashi Dolma, Joint Director Education Ladakh/Nodal Officer said that their purpose is to encourage and ensure specially-abled voters to cast their vote on May 6. She informed about the efforts taken by the Election Commission of India to make polling booths accessible to ‘Divyang’ citizens. Facilities like bathrooms, ramps, separate exit and entry, helpdesk will be made available for differently-abled voters. She further asserted that the SVEEP team is committed to ensure that no voter is left behind. Mohd Iqbal, PAGIR’s Founder & President urged all the specially abled voters to come out and cast their votes on May 6. A workshop on EVM/VVPAT designed for the specially abled voters was also conducted. A mock poll where voters got a real-time experience of voting, registration of voters in an electoral roll was also carried out.